Matt Pond – But Is It Any Good? OTHER SONGS YOU MAY KNOW: No, sir. None either. WHAT’S IT ALL ABOUT: Baroque / classical pop artist releases second album of sneakily hummable and inventive chamber pop tunes . SOME WORDS, PHRASES AND CLAUSES ABOUT THIS RECORD: Sometimes an artist will use strings and classical-type arrangements to make a grandiose and pretentious statement. This isn’t one of those records. This does have a few of those moments, but most of the record is reflective and tasteful. Matt Pond and his band roll through an album that’s somewhat a cycle about neighborhoods and yards and suburbs, and using vocals, arrangements, and pop sensibilities it slowly reveals itself to be memorable, if not melodious. Some of the tracks seem more experimental in nature, and they don’t always work (“Crickets” for one). Still, it’s an admirable album by an ambitious leader and his band. NOTES & MINUTIAE: Pond took on a job writing music for the Oxygen Network around this time. GRADE: B+: A good record to chill to, or be immersed in. LINEUP: Matt Pond, Steve Gunn, Brian McTear, Brendan Kilroy, Mike Kennedy; then Jim Kehoe, Matt Raisch, Josh Kramer, Brian McTear, Matt Poind, and Brendan Kilroy, and strings a plenty on both. WHAT’S IT ALL ABOUT: Two EPs released by the prolific songwriter and his group to tide people over between albums. SOME WORDS, PHRASES AND CLAUSES ABOUT THIS RECORD: If you have good music ready to go, why not release it, especially if it doesn’t quite fir in a new album. Well, that’s the modus operandi for Matt Pond and his group (Matt Pond PA). These are two separate EPs released in 2001, and on these, Pond’s chamber-rock sounds familiar even as he changes things up a bit (with a great guitar riff on “Put Your Hair Down” and about as high energy as he can get it “St. Andrews”). There’s some nice percussion work on “A List of Sound” – someone seemingly double-timing a cymbal. NOTES & MINUTIAE: The group started a recording contract with Polyvinyl after the first EP. GRADE: B+: Two EPs of good material that didn’t quite fit, or he was impatient to release, is a bonus for us. OTHER SONGS YOU MAY KNOW: Are you one to listen to sad chamber pop songs? If not, then probably not. WHAT’S IT ALL ABOUT: Creator of chamber pop music dials up the minor keys and sadness in his second album. 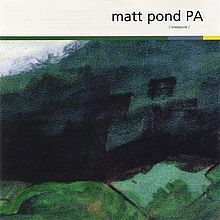 SOME WORDS, PHRASES AND CLAUSES ABOUT THIS RECORD: Matt Pond has a world-weary voice perfectly made for sad songs – and it fits in nicely with the unique instrumentation he uses. It’s a little baroque, and has very good use of cello and violin to accentuate the mood. The production is great and the arrangements are spot on. Measure is a very confident and mature album for a second record with such an ambitious musical view. What happens, though, is that after a while, it does get a bit repetitive, and you probably wish you could give Pond a cookie or something. So if you like the sadder side of pop and don’t mind some violins and cellos and other such stuff in your records, check this out. GRADE: A-: I wavered over this one. Yeah, it gets a little same-same toward the end, but when played in spots or shuffled, this is well worth a catalog slot.